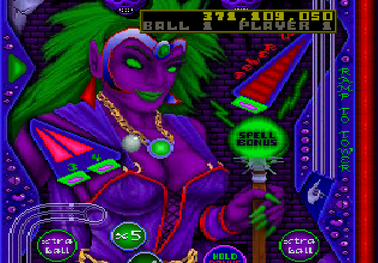 Ruiner Pinball is a video pinball game that was exclusive to the Atari Jaguar and released in 1995. This game featured two different tables. The first table is called Ruiner and is obviously where the title of the game comes from. This theme for this table is a cold war setting from 1962. Your goal is to decrease the Defcon level from 5 to 1, launch an attack on your enemy and defend your own country. The second table is simply called Tower and has a fantasy setting in which your goal is to cast three magic spells, destroy the tower and defeat the sorceress. Ruiner consists of two screens while tower has three screens. This game received mixed reviews but if you like the video pinball genre and you have an Atari Jaguar then I highly recommend it. Ruiner was criticized for not being much better than video pinball games of the 16-bit era like Dragon’s Revenge but personally I loved those games so that’s not much of a criticism as far as I’m concerned. It would have been nice to see more tables though. If you do want to give this one a try, you’ll have to do it on original hardware or try your luck with a Jaguar emulator. Ruiner is exclusive to that system and has never been re-released. Hopefully, these sort of Atari exclusive games will see a release on the new Atari VCS when it arrives.